ALBANY – Anne Marfey, long time resident of Albany passed in peace Saturday, June 2nd 2018 at the age of 91. She will be fondly remembered as a loving mother, dedicated teacher, distinguished professor, author, Danish pioneer, and champion of kindness and compassion throughout her life. Anne is survived by her children, Christina Goldfarb and Johan Marfey (Lynn); grandchildren, Brittany Commisso (Frank Jr.), Aren, Jason, and Dylan Marfey; and great-granddaughter, Gianna. Further survived by nieces, nephews, other relatives, and friends, her reverence for all life will always be with us. A Celebration of Life will be held in her memory at a future date. In lieu of flowers, a contribution to the Peter and Anne Marfey Endowment fund at the University at Albany would be appreciated. Checks should be made payable to the University at Albany Foundation with “Peter and Anne Marfey Endowment” written on the memo line. Send checks to: The University at Albany Foundation UAB 226, 1400 Washington Ave., Albany, NY 12222. For further information or to leave a message of condolence for the family, please visit www.HansFuneralHome.com . Anna was a truly special woman. Kind, caring, intelligent, and a very special woman. She was a wonderful piano teacher, gardener, and a very loving parent. My heart goes out to Johan and Christina, during this difficult time. I have many fond memories involving her, during my childhood. Your mother will be missed by many. Hvil i fred min ven! Our heartfelt condolences to Johan and Christina in this time of sorrow. Anne was a dear friend of mine for thirty years. She was a compassionate teacher and friend, finding inspiration in her Danish heritage. I will miss her deeply. 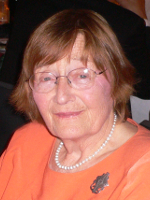 Anne was a wonderful lady and a gifted teacher of reading at St.Margaret Mary,s School. My son John enjoyed classes with her. I enjoyed visiting with Anne at parish functions. What a loss Anna’s death is to the community. She was such a generous hostess, Many of us will remember her wonderful Christmas parties with real candles on the tree. and summer garden parties. She was a creative artist , writer and teacher. eager to share her love and energy for all good things. She loved her family, all things Danish, and the world as her family. Rest in peace Mrs Marfey and my deepest sympathies for Johan and Christina and all of their families.